Organize Your Test Content Into Question Banks. Test Generator's Question Bank module is a repository for questions. Question banks can by organized by subject, objective, level of difficulty, grade and question type, or any classification system you choose. Test authors can create, store and manage one or many banks. 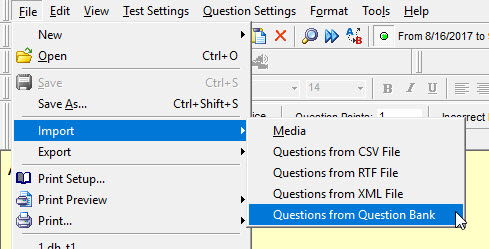 Questions can be created directly in a question bank, imported from a test or imported from one question bank to another. Also, TG's Test Wizard can streamline the test creation process by randomly selecting questions from one or more question banks, generating a test in minutes. 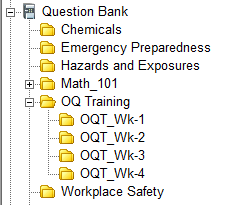 In order to use the QB effectively we recommend planning, organizing and creating your subject categories in advance. This will prove especially helpful if more than one test author will be using and/or contributing items to the QB. Once your subject categories are created, it's easier to assign subjects to your questions during test authoring. A little front-end planning will save you time later on. Once one or more question banks have been populated with questions, test authors can create a test that randomly selects questions from one or more question banks, generating a test in a matter of minutes. The Test Wizard can be activated from the icon toolbar under TG’s home screen. Subjects are both categories and "containers" in TG's QB. There is no limit on the number of banks you can create. Question banks can also be nested under a root bank. There are various levels of nesting possible and there is not limit on the number of items you can store under each bank.